The image of the Knight and his sword lives forever through sagas, making it easy to see why these swords are highly valued and handed down from generation to generation. 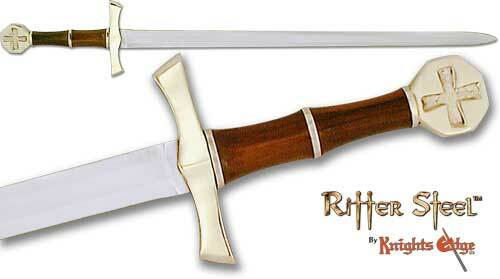 Our exclusive heirloom quality Crusader Sword is a well balanced and striking example of beauty in design! A very swift and well constructed 27" blade is hand forged from high carbon steel and tempered over hot coals, as was done back in the middle ages. The stylish guard is made of hand-cast solid brass as is the beautiful octagon pommel depicting the symbol of God: The Crusaders Cross! I love this piece. It's beautiful!